What are the five best features of Samsung's new flagship? The 16MP camera on the Samsung Galaxy S5 sets it apart from the 4MP cam on the HTC One (M8). The camera is adept to a wide range of lighting conditions, has several pro-grade features, a quick 0.3 second autofocus and can record videos in Ultra high-definition. 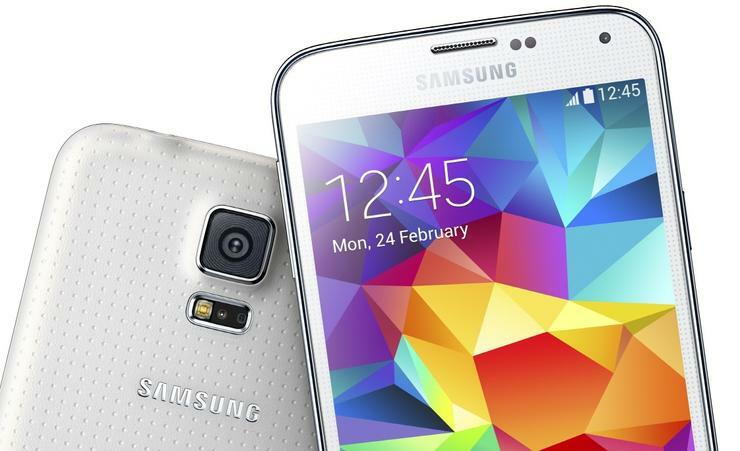 See photos for yourself in our full review of the Samsung Galaxy S5. Drastically differentiating the Galaxy S5 from its predecessors is its new waterproof credentials. No more will Galaxy owners have to worry about wet hands or if it suddenly begins raining. The IP67 rating certifies the Galaxy S5 in freshwater 1 metre deep for 30 minutes. Tradies will also appreciate the Galaxy’s resistance to dust. Samsung’s inflated TouchWiz overlay is effortlessly handled by the Snapdragon 801 chipset nestling inside. Selections are carried out with a sense of immediacy. Even the most intense of tasks are carried out with no problems at all. Real insight into how powerful the Galaxy S5 is witnessed when Ultra Power Saving mode is enabled. Superfluous features are deactivated to deliver the kind of battery life a Nokia 5110 could only dream of. The fully charged 2800 milliamp-hour battery will admirably last for 12 days in this mode, while just 10 percent of charge will deliver 24 hours of use. Ultra power saving mode will deliver that little extra battery life we all need from time to time. And on the odd occasion, when someone finds themselves stray, it could give them a lifeline. Displays don’t get better than the Full HD SuperAMOLED one featured on the Galaxy S5. Screens are paramount to how we use smartphones — they translate our touches, swipes and pinches into selections a smartphone can understand — and they breathe life into the photos and videos we relish. The screen on the Galaxy S5 is simply unparalleled. It makes every little thing you do that much more enjoyable.